LONDON – The government belatedly released secret files April 18 dating back to British colonial rule in Kenya, Malaya and elsewhere that were once claimed to have been lost. The government was forced to admit in January 2011 that 8,800 files had been secretly “migrated” to Britain from colonies prior to their independence. Its admission followed a High Court case brought by four elderly Kenyans who alleged they had suffered torture and brutality at the hands of British forces. The 1,200 records published April 18 are the first of six tranches due to be made public at the National Archives by November 2013. The papers cover controversial episodes including the 1950s Mau Mau uprising in Kenya and the Malayan “emergency” – in which the Daily Worker exposed atrocities by British troops against communist freedom fighters. They also revealed efforts to destroy and reclassify sensitive files. The Foreign Office claimed it was releasing “every paper” it can. “The British government did lie about this earlier on. This saga was both a colonial conspiracy and a bureaucratic bungle,” he said. Martyn Day of law firm Leigh Day, who is representing the Kenyans, said: “We are pleased to see the release of so many documents relating to the colonial era. This article was originally published in Britain’s Morning Star newspaper. Photo: Statue of Dedan Kimathi in Nairobi, Kenya. 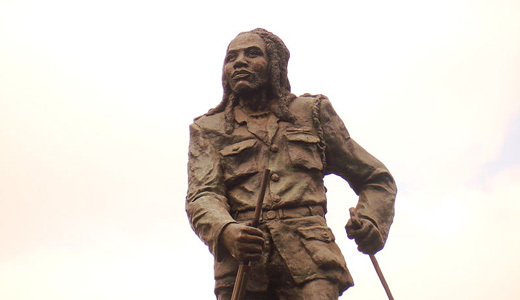 Kimathi was a Kenyan rebel leader who fought against British colonization in Kenya in the 1950s. He was convicted and executed by the British colonial government. Photo via Wikipedia. 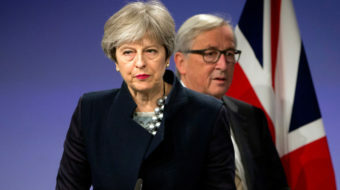 Brexit: To infinity and beyond? Maybe.